How do you choose just the right gift for someone special? First ask about the persons interests, hobbies, passions, etc. Consider their personality. Are they practical, whimsical, organized, care-free, casual, formal, a prankster, etc? What do they do with their free time? What grade or profession are they in? What culture/heritage/religion are they? What style of home, furniture, clothes, etc. do they like? The answers to these questions will help you create a gift-giving "e;profile"e;, which will help you to narrow your gift choices. Home decor items like lamps, clocks, art, and giftware make great gifts because they will be used by the special person everyday. Every time they use your gift, they will think of your thoughtfulness. Unlike larger ticket purchases like furniture, decor items fit into most normal gift price ranges and can reflect your good taste without disrupting the recipients theme or room style.Lamps are a great addition to a room, to help brighten dark corners or the highlight dimly lit work areas. Clocks are a classy gift. Just like watches, clocks can be given for special occasions like graduations, anniversaries, weddings, birthdays, etc. They will be looked at often, and have traditionally been given for special occasions. Home Decor and giftware items can add an individual flare to a room and can reveal your thoughtfulness, being sensitive to the recipient&apos;s style and fashion taste. Gift basket can be loaded with lots of goodies. Plan ahead! Keep a list of birthdays, anniversaries, etc. Purchase a gift when you find it, even if the occasion is several months away. Select quality gifts and choose color/style to please the recipient. Gifts do not have to be expensive to be appreciated or appropriate. Gifts that show your time and effort are just as special as expensive ones. Mom was right, its the thought that counts, and If you can surprise them with your thoughtfulness, you will be remembered. Avoid religious gifts except for close family members of the same religion. Save your receipts just in case a return or an exchange is necessary. The humane society does not recommend pets as proper gifts. Wedding/Anniversary:Choose a gift the couple will use, remember and appreciate. Since the home is the center of a good marriage, home decor items make great wedding or anniversary clocks gifts. Its fun to follow the Traditional and Modern anniversary gift chart. 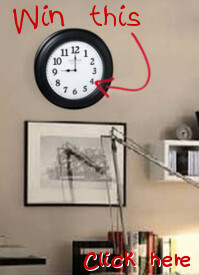 Retirement:Clocks make great retirement gifts. Many clocks include a brass plate to engrave a special message.